4. Moderato. La pauvre enfant (4-7-1888) 2'29"
6. Moderato. Tillegnad Fru M. Bundsen 0'59"
15. Intermezzo: poco allegretto 3'52"
By the beginning of the 20th century, the Swedish music world had matured ­significantly, as can be seen from the work of composers like Natanel Berg, Oscar Lindberg, Kurt Altteberg and another, whose name had a somewhat exotic sound in a country like Sweden: Olallo Morales. Olallo Juan Magnus Morales Wilksman (1874-1957), to give him his full name, was the son of diplomat, astronomer and ­meteorologist Olallo Morales Lupión (1852-1889) and his Swedish wife, Zelma, who was an accomplished pianist. The Morales-Wilksman marriage also produced other musicians: Zelmica who was a pianist, and Juan, a violinist. Olallo was born in Almeria on the 15 October 1874 and died in Tällberg on the 29 April 1957. In the Pahissa Diccionario (1927-28), Morales is included as a Spanish national. This is also the case in Pena-Anglés’s Diccionario (1954). However, the New Grove dictionary lists Olallo as a Swedish composer, and this was certainly his true nationality as can be seen by his passport. But, in his temperament, dreams, and devotion, was he not really an Andalusian? It was from his parents that he inherited his musical talent and it was they who sent him to Gothenburg in Sweden when he was only seven years old. There, he lived with his maternal grandparents and began his music studies, which he continued until 1889, at the Stockholm Conservatory of Music. Hilda Thegerström and Lennart Lundberg were his piano teachers in the Swedish capital. He also studied composition with Joseph Dente. But more decisive for his career was the private tuition he received from Wilhelm Stamhammar (1871-1927), an essential figure in Swedish music. He spent his childhood in Almeria and Sweden, but in 1881, after the tragic death of his father (who accidentally fell from the balcony of his house in Almeria while making astronomical observations), Morales ­established his place of residence in Sweden. 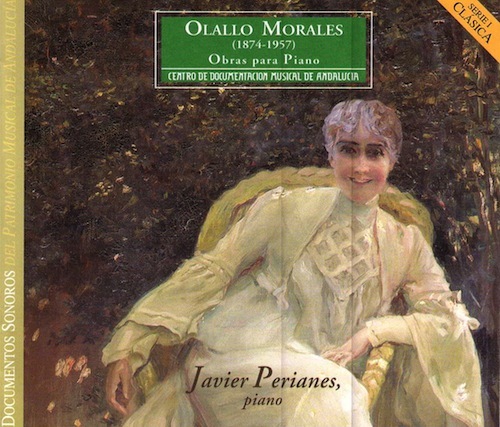 Supported by the Swedish government, Morales was able to expand his studies in Berlin with the illustrious pianist and composer Teresa Carreño, also receiving tuition in Composition from Heinrich Urban and in Orchestral Conducting from Hans Pfitzner. On his return to Sweden, he worked as a music critic from 1901 to 1905, and then went on to conduct the Gothenburg Symphony Orchestra in Sweden’s second largest city from 1905 until 1909, when he moved to Stockholm. Here, working as a ­critic, essayist, teacher, cultural curator, composer and conductor, he was to become one of the most important figures of the Scandinavian music scene. His intense ­activity in a wide variety of cultural fields (he was also the Secretary of the Swedish Royal Academy of Music) meant that he could not dedicate more time to composing. In spite of this, he left a considerable body of excellent work. Amongst his best works are the ballet The Wedding of Camacho, the Symphony in G Minor, Op. 5 and various overtures, including one entitled España, which in another ­manuscript appears with slight variations under the title of Abu Casem’s Slippers. Morales also wrote a Concerto in D minor for violin and orchestra which he dedicated to his Spanish friend, the violinist Juan Manén. His excellent work also included chamber music (of which String Quartet in D major deserves special mention), vocal and piano pieces, and songs. Throughout his life, Olallo Morales showed a great love and interest for anything Spanish. He visited Spain on several occasions and travelled to Granada to meet Manuel de Falla whom he much admired, and with whom he maintained an interesting correspondence. He founded the Spanish-Swedish Society whose aim was to offer support to all things coming from the land of his father. His advice was instrumental in the decision to award the Nobel Prize to Spanish dramatist Jacinto Benavente (whose play, La Malquerida, he also translated into Swedish). When travelling to Sweden, many Spanish nationals and artists such as the above-mentioned violinist and composer Juan Manén, Andrés Segovia, or José Iturbe all enjoyed his hospitality. The influence of Spain is also patent in Morales’ music, especially in his later work. This is mirrored in his Violin Concerto in D Minor, in the España overture – with its improvisational central section in true flamenco cante jondo style, which includes a vocal solo which can be heard in the distance; in the Weddings of Camacho Ballet – which is based on an episode from Don Quixote, and is greatly influenced by Manuel de Falla’s The Three Cornered Hat; and in the music for Lorca’s Blood Wedding which, as it is well known, is inspired by a real story which took place in Almería, the composers’ birthplace. In his piano works from the fantasy Nostalgia, Op. 15 to the later and emotive Andalusian Ballad (1945), the last piece on the record, there is a strong feeling of nostalgia for Spain, and particularly for his beloved Andalusia, which was present in so many ways in his home in Sweden. In the piano pieces, we can hear echoes of the School of Leipzig (Mendelssohn, Schumann, Gade), Grieg, Debussy’s impressionism, Liszt (perhaps more influential in Morales’ symphonic works) and especially Brahms, through his teacher Stenhammar. Also important in his work is the influence of Albéniz, especially the great Albéniz of Iberia. The pieces included in this record are a good illustration of Morales’ great contribution to the rich history of this instrument.